I LOVE cheese, especially smelly cheeses. One of the things I’ve recently learned is that the smelly cheeses are typically have washed rinds, which means that the outside of the cheese is brushed, or washed, with liquid as it ages. Different cheeses are washed with different liquids, each option providing a unique flavor profile to the cheese. Some cheeses are simply washed in brine. Other cheeses are washed with beer or cider. It depends on where the cheese is from and the local traditions. This week’s recipe for French Fridays with Dorie is miniature Munster Cheese Soufflés. 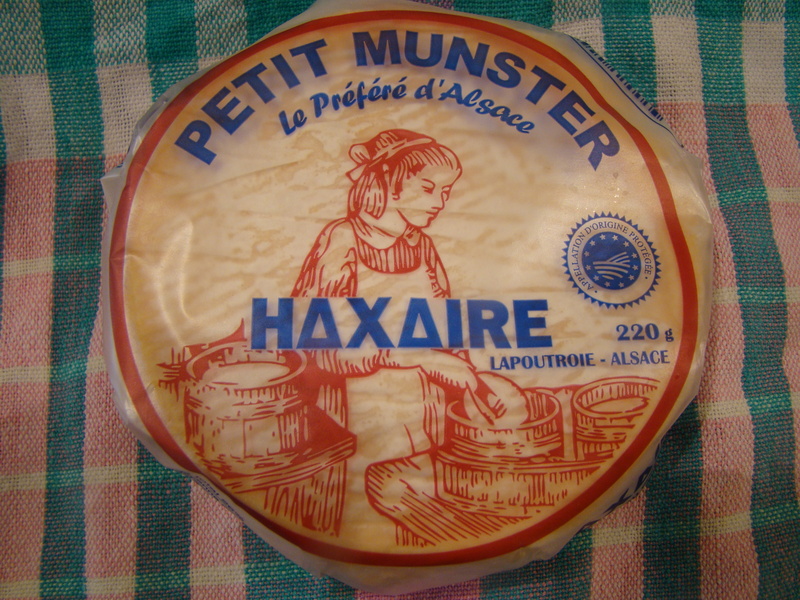 Munster cheese is a soft washed-rind cheese made with cow’s milk that comes from the Alsace region of France. Munster, not to be confused with the mild Muenster I grew up with (and still enjoy), is known for its strong aroma and taste. In the Alsace region, the residents typically eat Munster cheese daily, often with rye bread or, to emulate the bread’s flavor, other food seasoned with caraway, cumin, or fennel seeds (which all look the same, though taste quite different). For the soufflé, you start by making a thick bechamel sauce, seasoned with ground cumin. Then you whisk in egg yolks and stir in diced Munster. 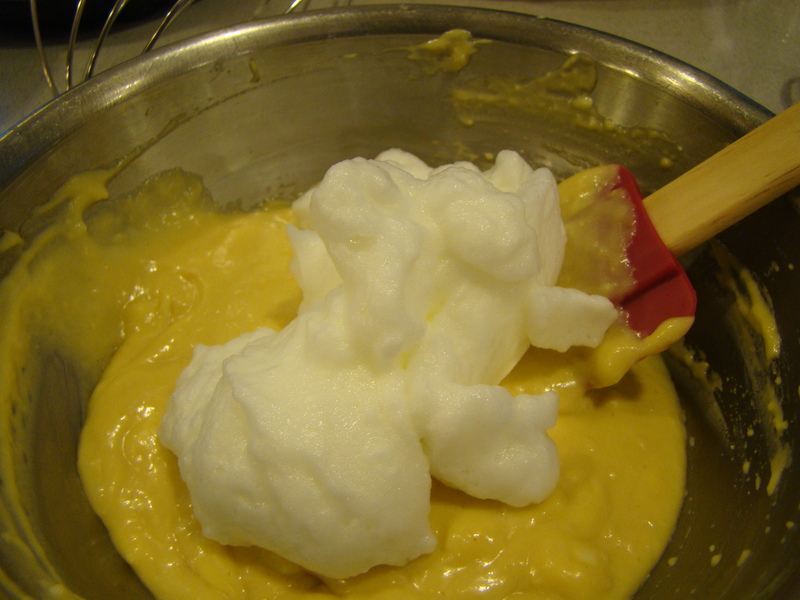 Finally, the egg whites are beaten until they are firm, then folded into the cheese mixture. Cheese soufflés have a reputation for being difficult to make, but I found it to be relatively easy. Dicing the cheese into small cubes was challenging. Even though the cheese was cold, it remained soft and sticky. After removing the rind, I tried freezing the wheel for about 15 minutes, but that didn’t make it any easier. I bought a cheerful new set of ramekins for the soufflés. The dishes I had were too small. I always love an excuse to add to my dish collection. The soufflés puffed up perfectly, and we ate them immediately. Good thing, because other two soufflés deflated within minutes. Reheated, they make an acceptable breakfast, though not at all light in texture. I’ll admit that the taste was disappointing. It tasted like cheese soufflé with a hint of cumin. The strong and unique flavor of the Munster didn’t come through at all. That’s too bad because the cheese was pricy ($12 for a 7 oz wheel). Next time, I’ll save the cheese to enjoy on its own with bread or crackers, not as ingredient in something else. I can’t find the recipe on-line, but you can find it in Dorie Greenspan’s book Around My French Table. 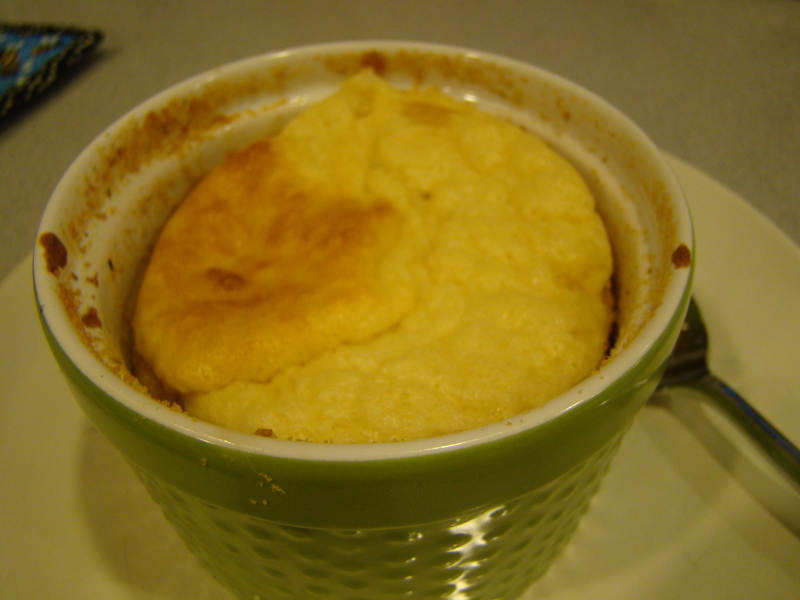 You can read more about other Doristas’ experiences with these soufflés here.